Did you know that we have a beautiful collection of mixed metal engagement ring sets and wedding band sets? 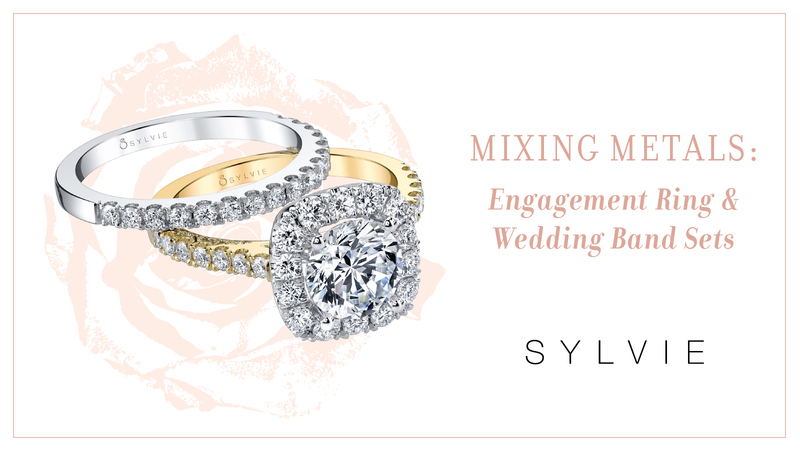 We’re all about mix and matching our engagement ring sets with rose or yellow gold wedding bands to add that WOW factor to your wedding set. All of our bands come in rose, white, and yellow gold and some even feature gemstones. Our stackables are great for mixing metals and styles, but we also have wedding bands that pair perfectly with our collection of unique mixed metal engagement rings. Whether you’re looking for something out of the box, our collection of mixed metal engagement ring and wedding band pairings are just what you need! 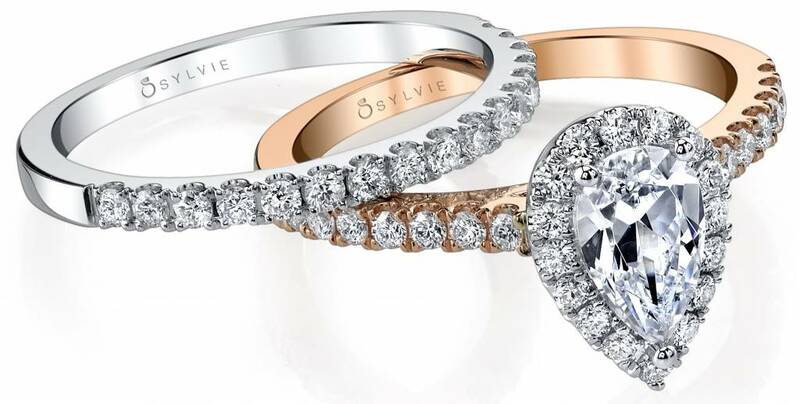 Today we’re talking all about Sylvie’s Top Picks for engagement ring sets and wedding band pairings. We’re mixing metals and pairing styles for the perfect wedding set that says, “Forever.” Make a bold choice this season for an out of the box look. 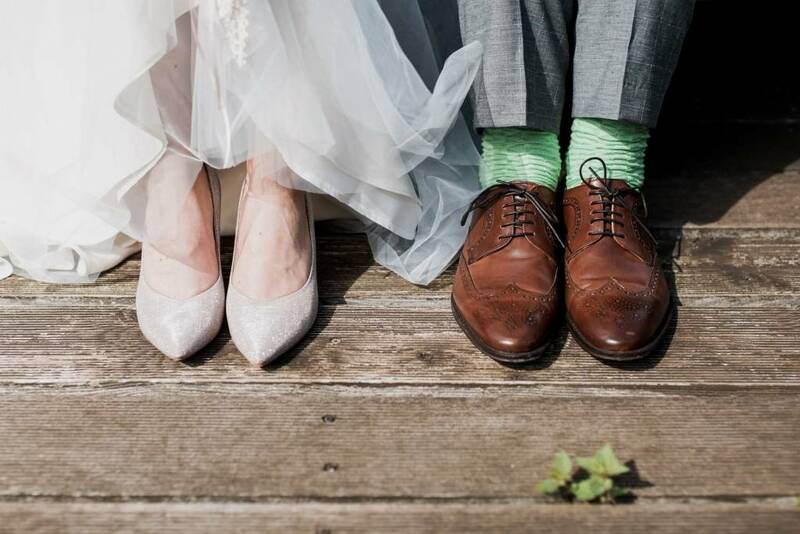 We’re choosing our favorite engagement ring and wedding band pairings – keep reading to find your perfect match! If your bride wants an engagement ring that represents her fun personality, then this is the one for her! A beautiful white and rose gold spiral engagement ring that features a 1 carat round center in a rose and white gold halo. 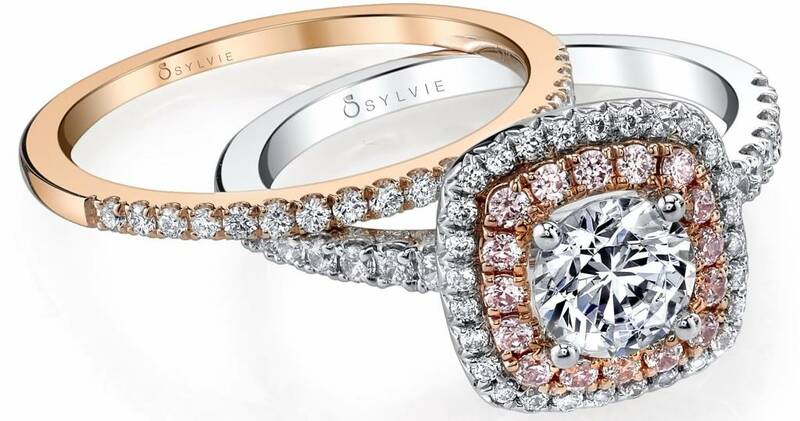 This stunning engagement ring set is unique, two tone, and challenges the traditional mark with mixing metals and even a different metal for the halo. You can also find more diamonds that cascade down the spiral shank with milgrain accents for a total of 0.36 carats. Mix or match this spiral engagement ring with any of our wedding bands for a unique wedding set that doesn’t stay within the lines! A classic double halo engagement ring with a twist! This two tone double halo engagement ring is everything we could ever ask for this Valentine’s Day. The rose gold features create a softer more feminine look and we’re all about it. Featuring a 1 carat round brilliant center with a total of 0.55 carats of diamonds, this double halo engagement ring is perfect for the fashionable bride. 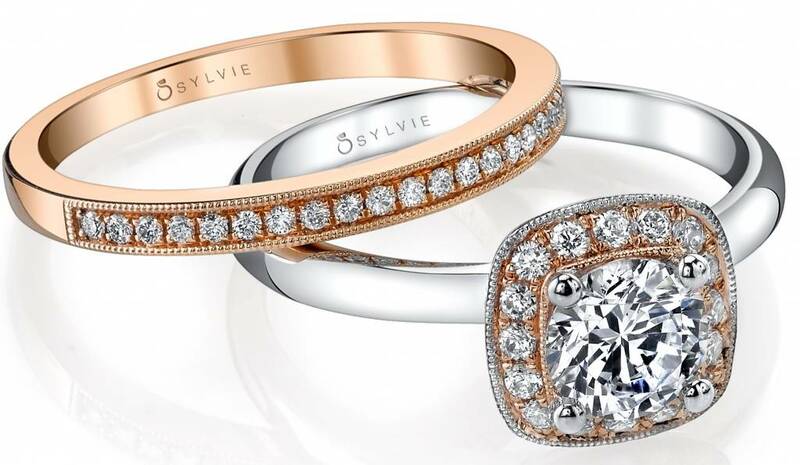 More glam the better with this gorgeous double halo engagement ring. The inner halo of diamonds is accentuated with rose gold prongs. If you’re looking for a mix of fun glam and tradition, this rose gold diamond wedding band will fit flush as a mixed metal look. With a total carat weight of 0.26, this wedding band is the perfect match for such a glamorous engagement ring. Our pear engagement rings are already unique on their own, but add a mixed metal shank and you have a one of a kind! This gorgeous pear shaped engagement ring features a 1 carat pear cut center diamond nestled securely within our signature halo. With a total carat weight of 0.41 carats, the sparkling diamonds continue down the sides of its rose gold shank. This engagement ring is perfect for the bride on a budget because it is one of our most affordable pear shaped halo engagement rings! This sparkling pear engagement ring matches perfectly with its classic wedding band in white gold. 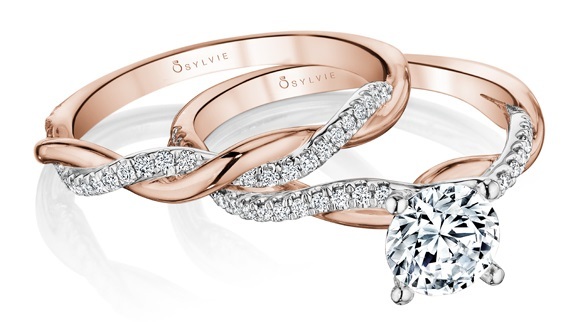 Our spiral solitaire engagement rings are sophisticated, glamorous, and shine brighter than most. The stunning center stone diamond and the sparkling diamonds down the spiraling shank give the ring that extra sparkle! Because let’s face it, you can never have too many sparkles. For this two tone spiral solitaire engagement ring, there is a mix of white gold with a pop of color! A solitaire engagement ring with a twist so to speak – a spiraling white gold band with white gold prongs. This beautiful solitaire engagement ring features a center diamond with a total of 0.72 carats of diamonds and a spiraling diamond and rose gold shank. This beauty pairs beautifully with any of our standard classic wedding bands, but mix it up and add its matching pair for a look that’s both trendy and fit for any bride! Although we exude “more diamonds the better”, a high polish shank looks glamorous with any engagement ring set. A perfect fit for the traditional bride who still wants her to ring to stand out in a special way. This gorgeous modern halo engagement ring features a dazzling 1 carat round diamond center surrounded by a rose gold halo of shimmering pave diamonds with milgrain accents. This gorgeous halo is all set on a white gold shiny shank that adds that sophistication that every bride searches for in an engagement ring. The total weight of this halo engagement ring is 0.20 carats. 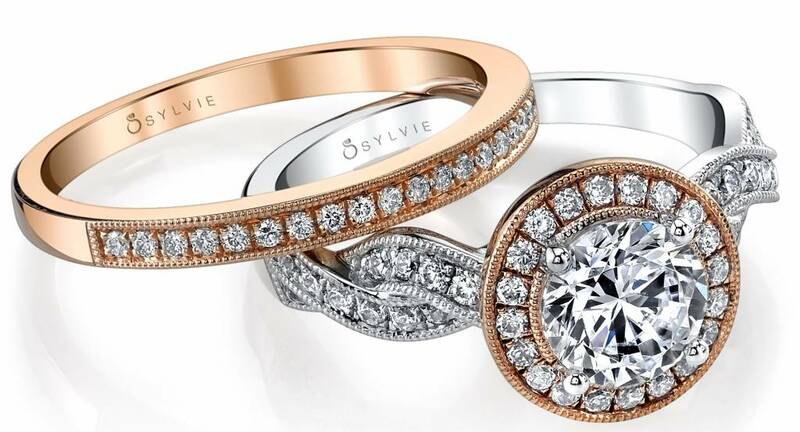 For more information about our sparkling engagement rings and beautiful wedding bands, please visit our website.